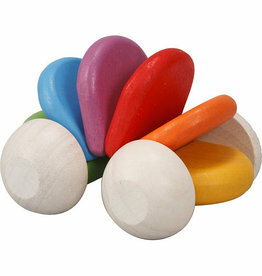 A soothing and gentle toy that will encourage young children to explore and experience music in a fun way. 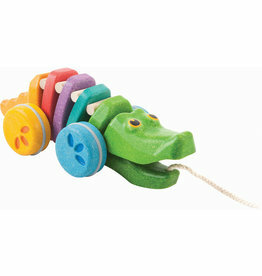 The colorful Rotating Music Box is ideal for newborns and up. Stomp-action fun with 2 soft, safe rockets and launcher base stomp. 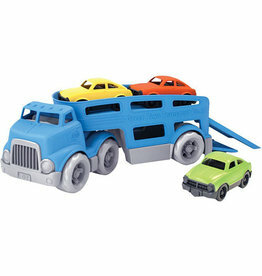 This colorful toy car has a flexible body that reacts to your baby's touch. What time is it??? 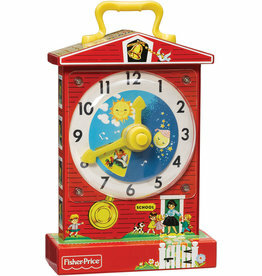 It's time for fun with this nostalgic teaching clock! Introduced in 1968, the Teaching Clock has a rotating dial and images that change each hour. Learning about time is always an adventure! Plays "Grandfather's Clock". Discover the fascinating world of the farm with animals (cow, pig, sheep...), a tractor and trailer... Includes 23 wooden pieces, 1 train with a set of 25 tracks and a box in the shape of a farm to complete setting. In a big suitcase with plastic handle. Wooden race car. Collect the range's many models: Speed, formula 1, retro motor car, roadster and racer. Compatible with all sets of Story range. Printing by heat transfer. Wood Cherry tree.